Opening Times: Mon-Sun 0900-2230 but often shut for football matches so ring to check. Club times (Blue Star H, floodlit, exclusive) Mon & Wed 1800-2100. Floodlights: Yes but only turned on for club sessions or if there are more than 10 users. 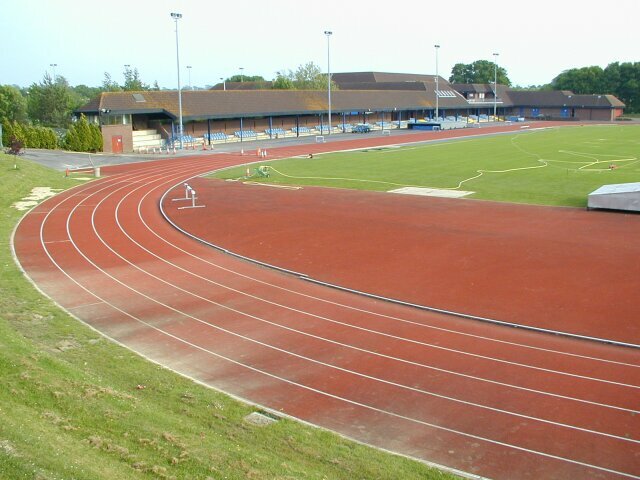 The track was opened in April 1986 by Dave Moorcroft and was a brand new track. It originally had an En-Tout-Cas Olymprene surface and was resurfaced in 1998 with Polytan PUR. The LJ/TJ and PV runways are coloured blue because this is the corporate colour of Horsham District Council. There is a narrow covered stand along the whole of the home straight and the infield is a football pitch which is reported to have the best playing surface in the area. The steeplechase water jump has been height adjustable here since at least 1993 and it is thought that the first ever women's 3000 steeplechase in the UK with 2'6" barriers took place here on 22nd Aug 1993. It is thus apt that it was announced in July 2001 that Horsham will become a specialist centre for the development of women’s steeplechase. There is also an indoor straight in the Leisure Centre.